From the publishers: Most Australians despise what Pauline Hanson stands for, yet politics in this country is now orbiting around One Nation. 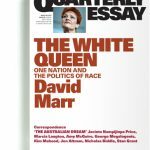 In this timely Quarterly Essay, David Marr looks at Australia’s politics of fear, resentment and race. Who votes One Nation, and why? How much of this is due to inequality? How much to racism? How should the major parties respond to anti-immigrant and anti-Muslim voices? What damage do Australia’s new entrepreneurs of hate inflict on the nation?